Yes, that James A. Garfield. 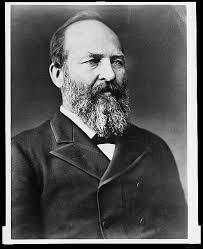 A while ago, The Conlanging Librarian posted some information on James A. Garfield. Well, something that many people don’t know about the man who would become the 20th President of the United States was that the courtship with his future wife, Lucretia “Crete” Rudolph, began (in a series of letters) as a back-and-forth discussion on the value of studying ancient languages and why the “diversity of languages was given”. You’ll now find relevant quotations from these letters, dating from January 1854, posted at The Conlanger’s Library in Quotations under Language and Specific Natural Languages. Enjoy! Yes, that James A. Garfield. I’m currently reading a biography of our 20th President. Why? First, he was born just a little over ten miles from where I live. Second, he was a fascinating individual and his Presidency (to me, at least) seems like it was a missed opportunity. “But what does he have to do with conlangs and languages?” Glad you asked. Check out the Quotations site of The Conlanger’s Library for a very favorable quote of Garfield’s concerning German. Yes, German, that language disparaged by Mark Twain. Garfield was also a scholar of “dead” languages and was a professor of Latin and Greek. His fiancee, Lucretia Randolph, and he actually exchanged letters concerning the worth of studying languages. Alas, but Garfield’s language acumen didst not blossom into the full grown flower of language creation…ahem, sorry, I was channeling the 19th century’s prose. Mea culpa.